This is a trail on the western slopes of the Catalina Mountains below Samaniego Ridge. Most of these trails in this area are used as mountain bike trails but do see some hikers, especially as you get higher up on the slopes of Samaniego Ridge. There is a maze of trails in this area many of them are not official named routes. Signage in this area is nonexistent. This trail is entirely on National Forest but access is via State Trust Land. A State Trust Land Permit may be required. I was informed by the locals that hiking in the area didn’t require a permit but parking on state Trust Land probably does. The rules for State Trust Land require that you get a permit if entering Trust Land. I went on line and got a year pass for $15.00 to be on the safe side. The Majority of the trails in this area are on National Forest but the Trail Heads are on Trust Land. Access to the 50 Year Upper Trail is from the Golder Ranch Road Trail Head via the 50 Year Trail or the Middle Gate Trail. Other than the Baby Jesus Trail, the 50 Year Trail and the Cherry Tank Trail, Very few of the trails in this area are trails anyone would decide to go out and do. Most of them are connector trails for a larger loop trail. That’s where I ran into problems; there is very little documentation of these trails and nothing on any official maps that I could find. 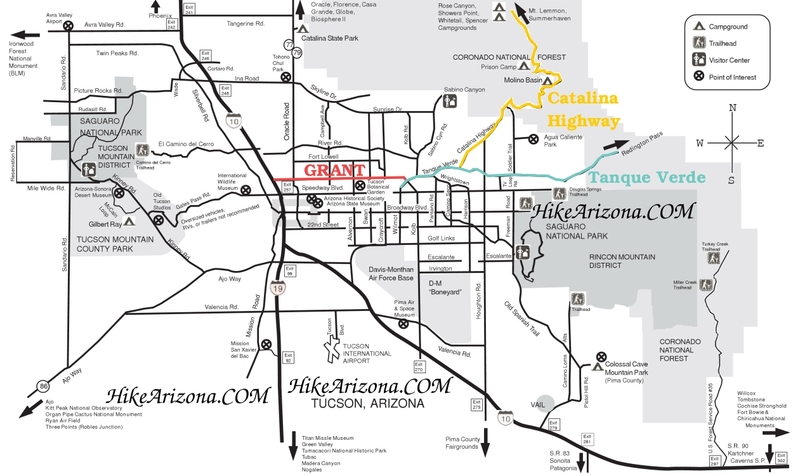 Many of the trails don’t have names, the only ones I could find on any kind of map was the 50 Year Trail, Baby Jesus Trail and the Cherry Tank Trail. The rest I got from mountain bike organizations or local hiking groups. The 50 Year Upper Trail connects the Middle Gate Trail to the 50 Year and Gem Trails. This 1 mile trail runs northeast from its start point on the Middle Gate Trail and gains 300 feet along a ridge that parallels Sutherland Creek. The trail is easy to follow and in good condition. Two trails have their start points along this trail and they are the Cowboy Slickrock Trail and the Cherry Tank Upper Trail. The views from this trail, though not earth shaking are Pusch Ridge, Oro Valley and Tortolita Mountains. On the lower end of this trail at the Middle Gate junction is a spur trail, it is an alternate connection from the Middle Gate to 50 Year Upper Trail. The Middle Gate Trail from the south drops into Sutherland Wash and this is where the 50 Year Upper Trail heads off to the northeast. If coming from the south on the Middle Gate Trail and you are heading up the 50 Year Upper Trail take this spur trail. It is 0.2 miles long and avoids the final drop down into Sutherland wash and the climb back out without adding much in mileage. If you miss the trail it is no big deal the drop into the wash is 50 feet and the climb out is 20 feet, most hikers do this in their sleep. You can do what I did and do both routes to get a GPS route.